Astronomers used data from three X-ray satellites: ESA’sXMM-Newtonspace observatory and NASA’s Chandraand Swiftobservatories to discover a strong, stable and periodic burst of X-ray radiation that appeared to originate from very close to the edge of a black hole. The signal brightens and fades every 131 seconds, the last at least 450 days. 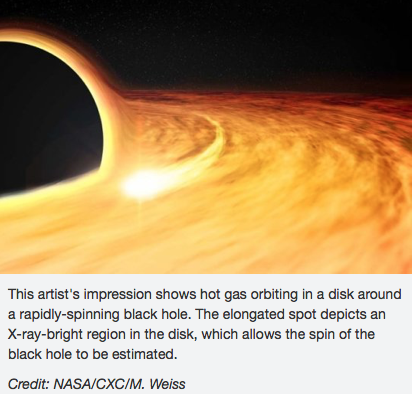 Scientists believe that whatever is emitting the signal must be orbiting the black hole just outside the event horizon, the smallest orbit in which a particle can safely travel around a black hole. The black hole is located in the ASASSN-14li system, that was detected in November 2014, using the Automated Survey for SuperNovae (ASASSN). Taking into account the mass of the black hole, estimated to be about 1 million times that of the sun, the group of astronomers calculated that the black hole is spinning at about 50% the speed of light. Dr. Pasham, first author of the relevant publication, said that “In the next decade, we hope to detect more of these events. Estimating spins of several black holes from the beginning of time to now would be valuable in terms of estimating whether there is a relationship between the spin and the age of black holes.